Another week, another media frenzy over our pope. 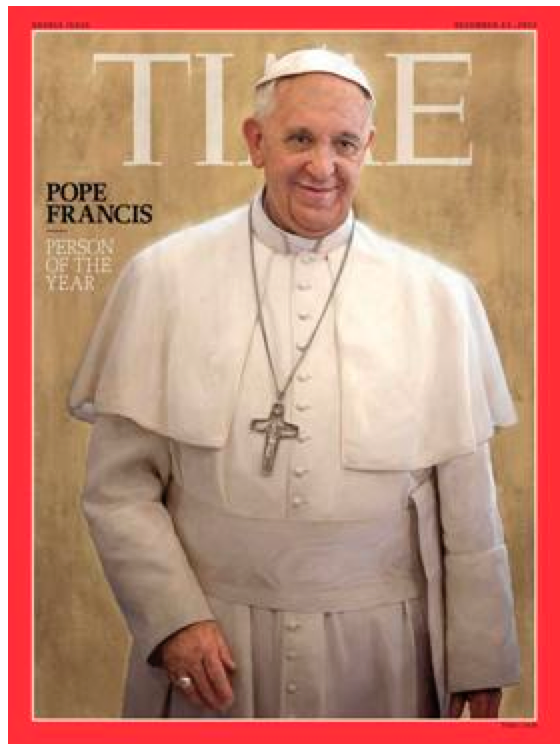 This morning Time announced they have selected Pope Francis as Person of the Year. Good news? A non-story? What to make of this all? George Weigel has said that the late Blessed John Paul II regularly inquired of his visitors the details of what was happening in their corner of the world. According to Weigel, the pope wasn’t as much interested in the political stories that dominated the headlines. He was more fascinated by what the Holy Spirit was doing through these events. Which brings us to the widespread popularity of Pope Francis. What is the Holy Spirit up to? According to the headlines this morning, the Holy Father’s approval rating (who knew there was such a thing!) is at 92% among Catholics. Non-Catholics too are intrigued. Even non-religious. And the media, evidenced by today’s news, loves him. But wait! Many of you are writing us saying: these people don’t understand what our Church teaches! They aren’t pro-life, they don’t defend traditional marriage, or they don’t believe in the Real Presence. The Church is most assuredly facing significant threats. The list is long, and we need not recount them all here. The newfound popularity for Pope Francis and the Church can at times seem like a contradiction. Many new people are intrigued by our Church, while its adversaries seemingly continue to grow. We can’t help but recall St. Paul’s letter to the Ephesians. For it seems that what we are witnessing is the battle not of flesh and blood, but of spiritual principalities. Satan is worried. And he is working overtime. We see his poisoned fruits everywhere in our culture. But the Holy Spirit too is clearly at work as well. Big time. Will the popularity of our Holy Father translate to a deeper faith among Catholics? Will it lead to higher Mass attendance, more vocations, and a greater embrace of the fullness of Catholic teaching? We don’t know. The ways of Our Lord are a mystery. But we do know what Christ promised us in his Church. With all prayer and supplication, pray at every opportunity in the Spirit. To that end, be watchful with all perseverance and supplication for all the holy ones’ and also for me, that speech may be given me to open my mouth, to make known with boldness the mystery of the gospel. Good press for our Church. Not sure how much stock I put into Time considering their second choice but this cannot hurt.